Recently my girl Jess has gotten back into crocheting. I think all of my knitting and love of yarn made her want to pick up her crochet hook again and get creative. I’m telling you, knitting is therapeutic and just amazing to see something come to shape. 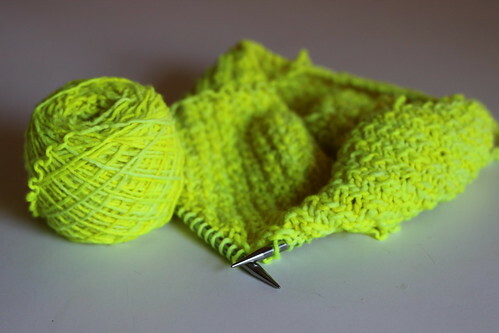 This yarn is my absolute favorite, Manos del Uruguay Maxima yarn in Highlighter. It is just shockingly neon and so soft. I had previously knit it into a simple triangle scarf but it didn’t drape well so I took it apart and rewound it and now I’m making a cowl so I can have a bright neon pop with my outfit. I’ll share the finished product when I’m done. I also thought I’d share the other two projects that I’ve recently completed for myself. 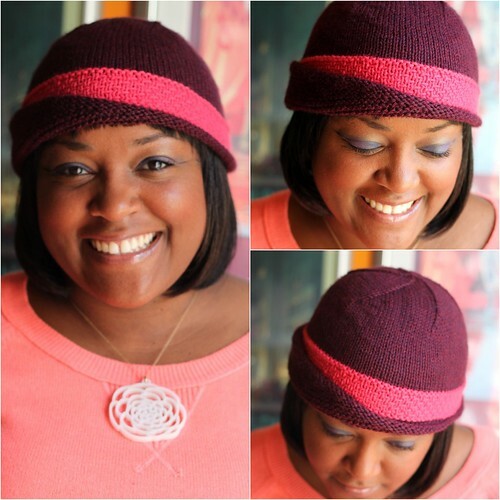 My absolute favorite hat (since I just started to make hats this year) is the Lucy hat from the Winter 2012 issue of Knitscene (yes, I’m a knitting nerd and I know it). I love the asymmetrical turned up brim and I love the colors I picked. I have a very bright hot pink coat that I’m wearing right now and I liked using burgundy instead of black, not as dark and heavy. 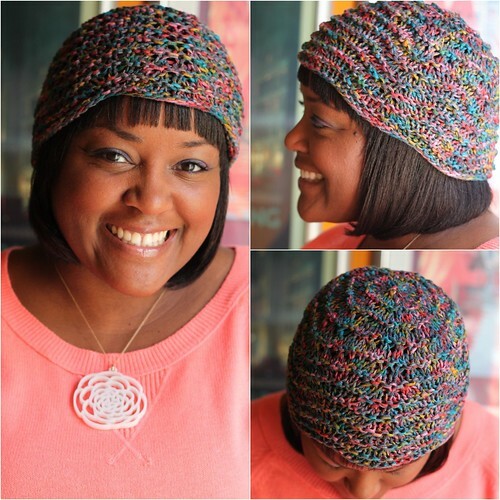 The second hat is the Feather & Fan hat and it was a free pattern from Cascade Yarns. I used Berroco Versa yarn in Vesuvai, I bought the yarn for myself as a birthday gift. I loved the rainbow color and pattern and decided to save it until I found the perfect project and this was it. Total knitting nerd and totally in love with it. I’m going to New Orleans this week for a vacation and I’m sifting through my yarn stash to figure out what will come with me to work on during the week. I’ve got some Christmas gifts to get finished! I love the Lucy hat! I recently saw it on Ravelry and fell in love with it. Your color choice is cute. You definitely have inspired me to try that out as soon as I hone my skills (still a newbie!). Thanks so much for sharing! The Lucy hat is to die for, Dana! I need one too, but I’m definately not gonna make it..I don’t know what’s wrong with my hands.. Thanks for the post!!!! Lovely projects. I’m gonna go check out both patterns on Rav. I love what you did with the Lucy hat but my locs wouldn’t fit under it. The Feather and Fan … they just might. Thanks for sharing!